Our ranking of the NYC's best new restaurants of the year. Before we begin, let’s get one thing out of the way. No, this is not Oiji like the magic board from your childhood that allowed you to communicate with the spirit world at sleepovers. That’s Ouija, and by the way, it’s made by Hasbro. Pretty sure the underworld isn’t choosing to come to us via something sold at K-Mart. 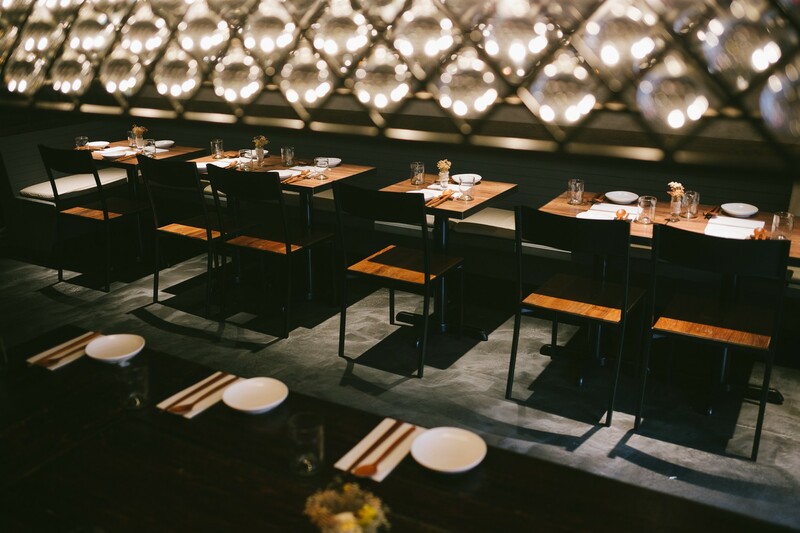 This is Oiji, a very popular new “modern” Korean restaurant in the East Village. After reading that sentence, you’re probably thinking to yourself, “Did we really need another one of those?” All you need to do is have dinner here once to decide that yes, we absolutely did. For all of the things that the countless “modern” “Asian” restaurants around town are, what they most often are not is good for any situation in which you’d like to accompany your meal with something other than one or seven light beers. That’s not to say that the Momofukus or Hanjans or Kang Ho Dong Baekjeongs of the world aren’t excellent restaurants. But name one that you’d order a nice bottle of wine from. Oiji is the kind of place that will have you thinking about what to drink that will pair well with your meal, not because you are a wine snob, but because the food here is so interesting and delicate and carefully prepared that an OB would seem inadequate for the occasion. Like wearing a dress shirt to work with “business shorts.” Nobody’s going to say anything to you, but you know deep down it’s not right. I think the thing that impresses us most about Oiji is the fact that it feels so unique, even though the idea of another new Korean restaurant seems so ordinary. We have been absolutely floored by how good a few particular items from this menu are, ranging from a piece of smoked mackerel that you brush citrus soy onto with a tiny pine needle brush to an excellent and simple plate of fried chicken. It’s a more upscale experience than you probably expect from a restaurant on this block, and even though the room is tiny and cramped, you get the feeling that you’re going to have a special meal from the moment you sit down. Now close your eyes, put your hands on the oxtail, and see if it moves. That’s the spirits telling you to eat it. A plate of tiny crepes, served with an assortment of things to put inside them. A good way to feel like a creative, hungry, giant. Start your meal here. A true “holy sh*t” moment. Those moments don’t come around often, but when they do, we talk about them, and we’ve been talking a lot about this fried chicken. Served in a pool of the best citrusy spicy sauce we can remember eating, the chicken is sliced into thin strips and has an excellent light but crunchy exterior. An absolute must order. A hot bowl of rice, egg, and beef that’s been boiled in soy sauce. Simple, filling, and delicious, though less interesting and exciting than most of the other things on this menu. Get it, but surround it on the table with more adventurous plates. Sort of like the black miso cod from Japanese fusion restaurants, but much more delicate, and this one comes with a tiny pine needle brush so that you can paint some citrus soy onto your fish. Any plate of food that comes with its own tool, we are fans of. This is probably not the dish to order on the summer’s hottest day, but it is absolutely the thing to order any and every day in February. A bowl of hearty oxtail that falls off the bone and will make you stronger. Very good. A bowl of Honey Butter Chips constitutes the entire dessert menu at Oiji. These things are quite popular, both at here at the restaurant and in Korea, we’re told. They’re basically just very sweet potato chips, so yeah, we get it.